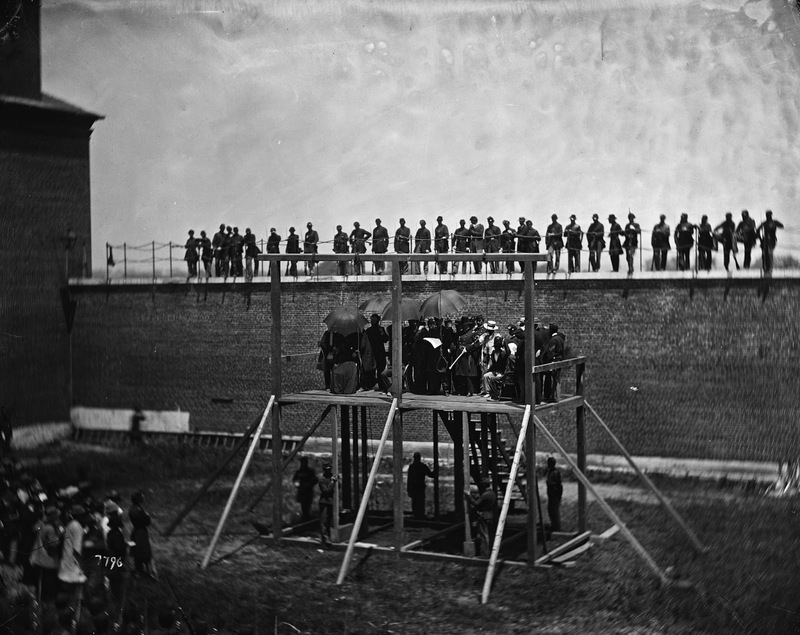 The condemned Lincoln conspirators on the scaffold, 1865. 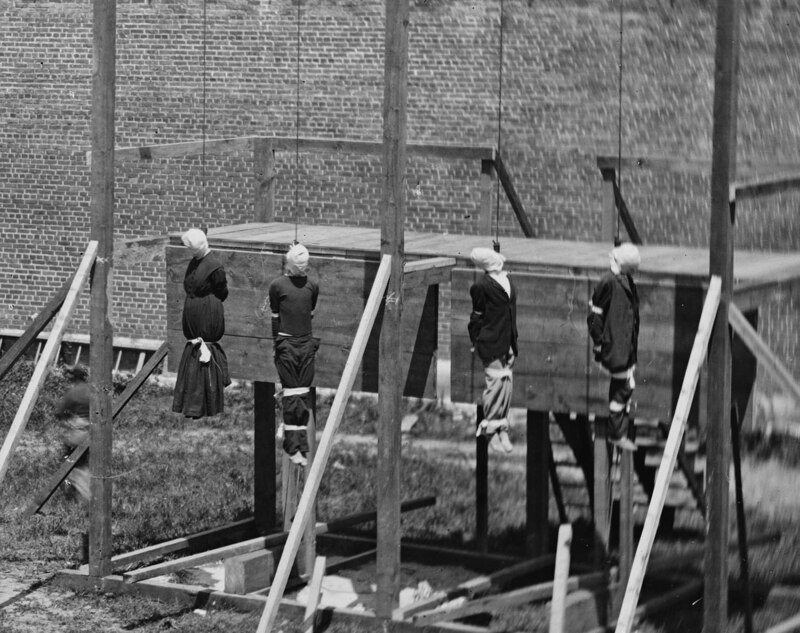 This set of pictures from 1865 showing the hanging execution of the four Lincoln conspirators: David Herold, Lewis Powell, George Atzerodt and Mary Surratt. 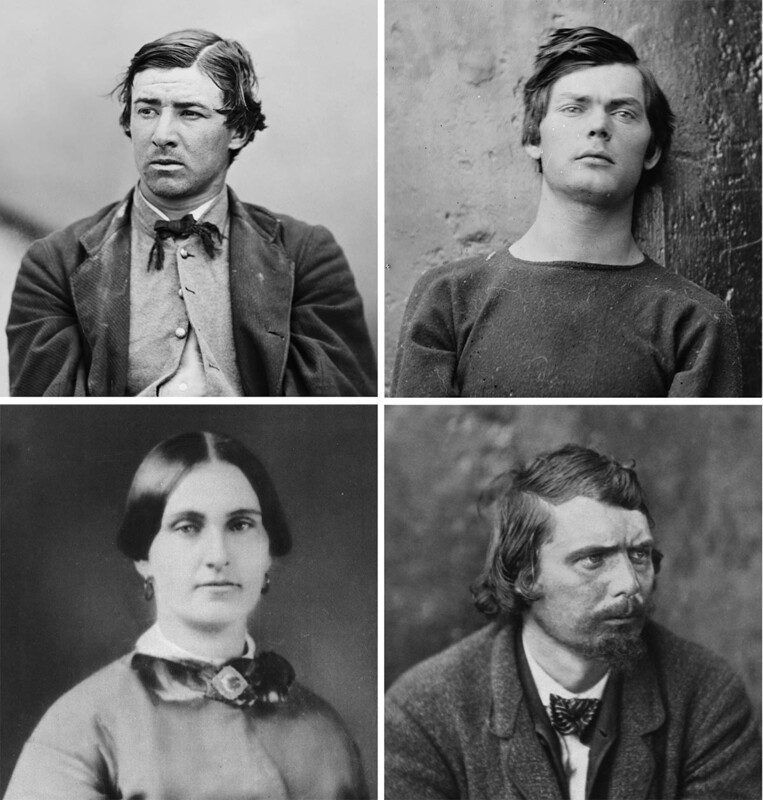 Their deaths were a culmination of sorts of a nation ravaged by war, bitter conflict, and the death of the nation’s commander-in-chief, Abraham Lincoln. 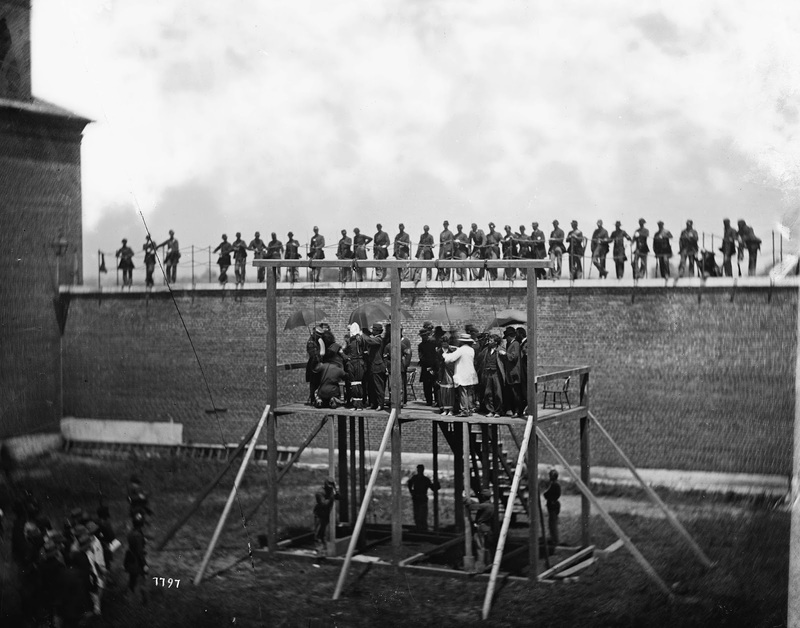 Scottish photographer Alexander Gardner captured the macabre scene, including pictures of the condemned seen moments before they walked to the 12-foot gallows, specially constructed for the executions. It was hot that day, reportedly a hundred degrees (38 degree Celsius). Sweat surely dripped down the accused’s faces as they passed by the cheap pine coffins and shallow graves that had been dug for them. 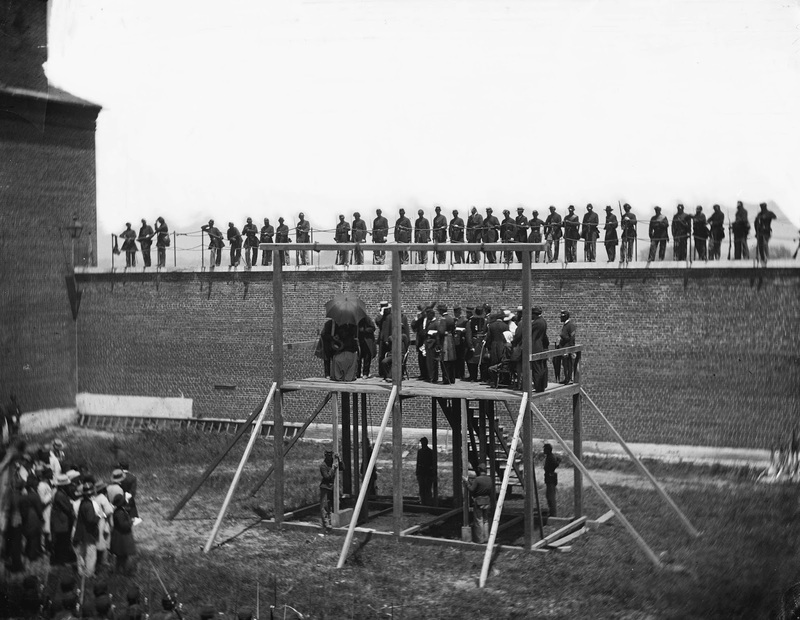 After the Lincoln assassination the government arrested several hundred people. Most were soon released due to lack of evidence. However, the government did charge eight people with conspiracy. 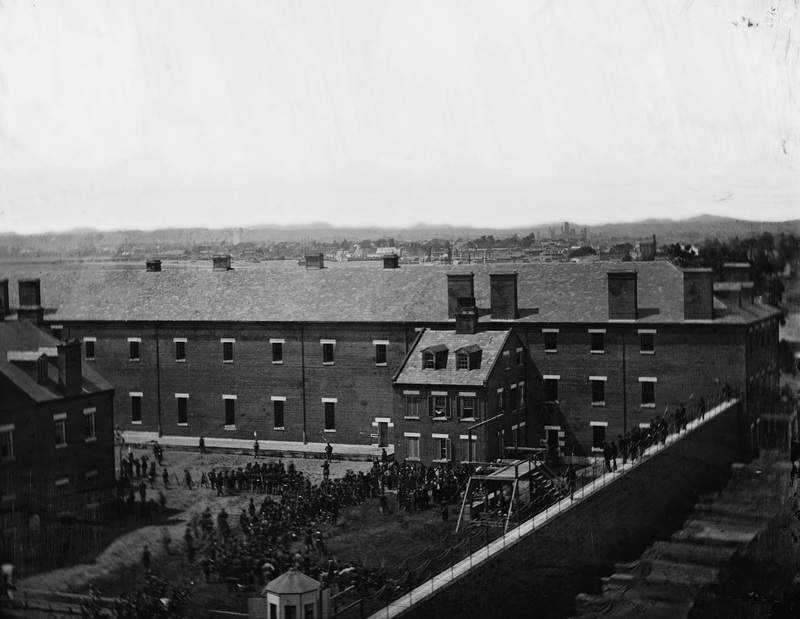 On May 1, 1865, President Andrew Johnson ordered the formation of a military commission to try the accused persons. The actual trial began on May 10th and lasted for about seven weeks. The defendants were allowed to have lawyers and witnesses, but they were not allowed to testify themselves. She seems to have been guilty of something, maybe allowing conspirators to commit kidnapping, which unknown to her, turned into murder. Did she commit some type of felony murder? Although no one seems to get death for that? How were the military courts allowed to deny defendants their right to testify in their own behalf? How did the military get jurisdiction? Mary was a civilian, and the war had ended? Was anti-Catholicism a factor? She apparently had a large number of priests testify for her, during the trial. It wasn't a unanimous verdict? How did the jury split? Mary was aware of the plot to murder Lincoln. She lied about knowing any of this. If she had told her interrogators the truth, she might have just been sentenced to prison. She would be sentenced to prison and not be let go because she knew about the conspiracy and didn't inform the authorities. Hope this cleared it up for you. The entire process from trial to execution was a crime! The accused were not given enough time to create a defense. In what legal trial in the US is a defendant not allowed to speak in their own defense; and allowed to be executed without a unanimous verdict? 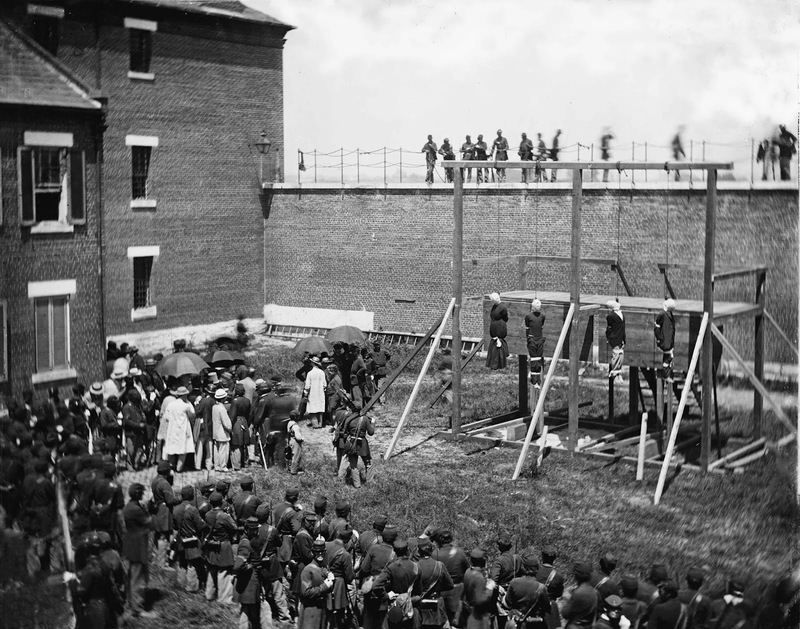 The country wanted to hang someone for Lincoln's murder and didn't care about the "rights" of the accused.